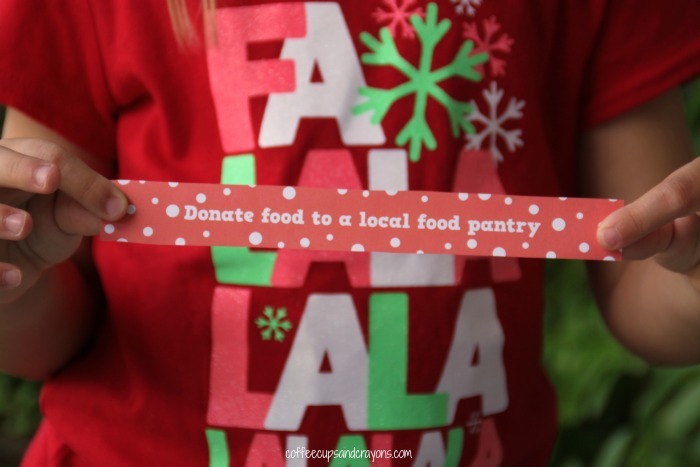 We love counting down to Christmas with 24 Random Acts of Christmas Kindness and know you do too! Doing daily acts of kindness in December has been a wonderful way to celebrate everything that is good about the holiday season. This year we created a free printable Random Acts of Kindness Advent Calendar and couldn’t stop there. We’ve partnered with Carli of Dimple Prints to create a free printable Random Acts of Kindness Countdown Chain! 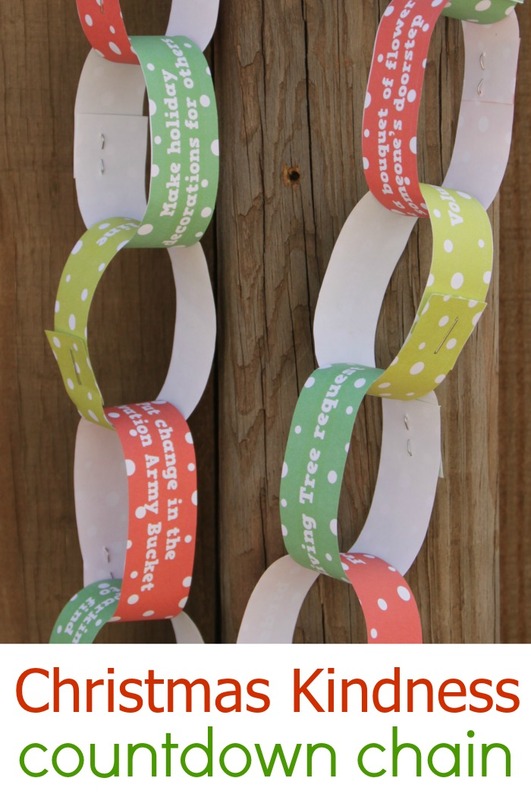 For those of you that want to create your own RACK countdown, or would like your kindness to be a little more random, Carli has created a free printable with 40 different acts of kindness chain links you can print and use! 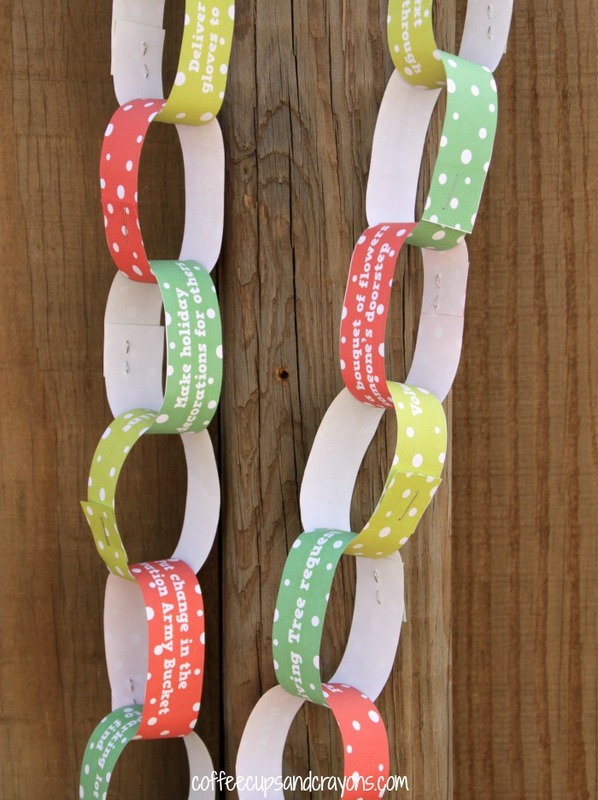 My kids were crazy excited to see the kindness chain links start to come out of the printer! They are so bright and cheery! Carli included all 24 Random Acts of Christmas Kindness from our 2014 RACK advent calendar so the kids have them cut and ready to go for next week. I think the best part about this printable RACK countdown chain is that you can use it anyway you want! You can go through and pick out the RACKs you want to do with your family this year and put together the chain yourself. Then each day the kids can take a link off the chain to see which act of kindness they are doing to do. Or you can let the kids choose which RACKS they want to do this year and put them all in a jar. Then every time your family does an act of kindness you can add a link to the chain. It’s such a fun way to watch your kindness grow! Regardless of how you are going to organize your Random Acts of Christmas Kindness this year we would love to see what you do! 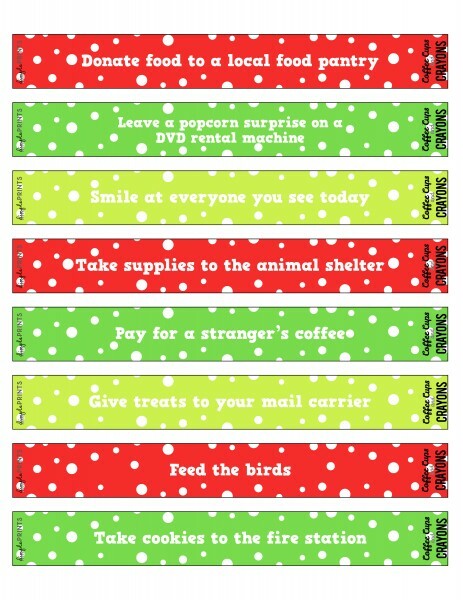 Each day in December I will be sharing special RACK graphics to go along with my Random Acts of Christmas Kindness Advent Calendar on the Coffee Cups and Crayons Facebook page so people can share them with their friends and show others the fun things their family did that day. Even if you don’t do 24 or don’t follow along with the ones we are doing that day we would still love you to share what you are doing. It’s a great way to cheer each other on and develop a community of kindness this holiday season! 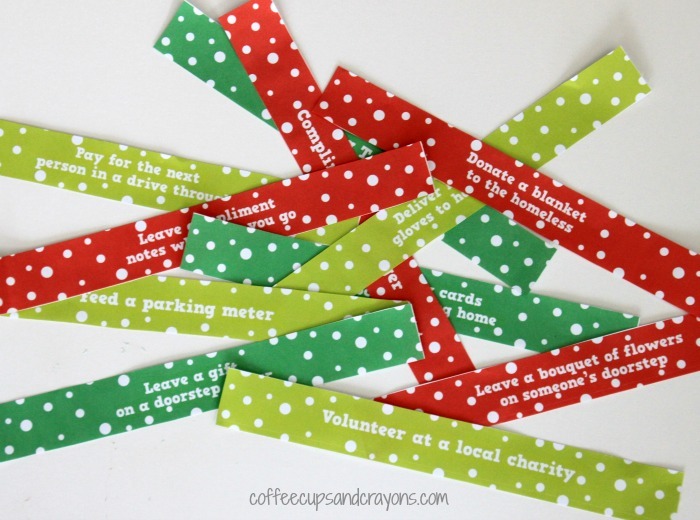 Head over to Dimple Prints and download the free printable Random Acts of Christmas Kindness Countdown Chain! Here’s a sneak peek of one of the pages…so cute right??? We were having a rough day today. We were supposed to take a Santa Train ride. I had been hyping it up to my almost-2 for weeks now and I had out-of-towns guests that came just for the occasion. Late the previous night we received a phone call that our ride had been canceled and I tried to quickly come up with a back-up plan. Since was daughter was asking for Santa, hot cocoa, and a choo-choo, I knew our local mall could deliver. I pre-paid fora a Fast Pass so we wouldn’t have to wait in line to see Santa and gathered up our grumbling bunch. We got a quick picture but had to wait 30 minutes until the train opened. My dad suggested letting my daughter ride one of the coin-operated cars in the meantime. As we were trying to figure out how much it cost, I saw a ziplock bag taped to the slot. There was a note that said we’d been RACK’d, candy, and 3 quarters to pay for my little girl’s ride! I just have to say that the gloomy mood our party had been caring around was immediately lifted and changed our outlooks for the rest of the day. The note listed the website on the bottom, so I knew I needed to thank you for doing this. And of course, I am going to have my little girl help me do some RACKs in return! Oh how lovely!!!!! Thank you so much for sharing with us!!!! Isn’t it amazing how a little thing can really change your day! I’m so happy to hear you are going to spread some kindness too! Yesterday after shopping for groceries in Dexter, MI. I saw a note on my car. Thinking it was just another advertisement, I was shocked when it was a candy cane with a note I’d been “Rack’d” counting down 24 days to Christmas with a random act of kindness. It made my day! THANK YOU, what a lovely thing to do! If only all of us could learn to do random acts of kindness to each other what an amazing world this would be. So, I have decided to make/print 24 chains for each of my family members and mail it to them around Thanksgiving time so they have it to start on December 1st. I’ll mail them flat and they can have a family time of reading them, taping them, making plans for their RACK-ing. By the way, every Thanksgiving, we have a ‘Thankful Jar’ with a pen and slips of paper by it… during week before dinner as well as day of, we can write things we are thankful for on slips of paper, fold up, put in jar. We have had some great fun reading these around the dinner table on Thanksgiving day……some are sweet, some are hilarious and it has made the day extra special for our family. What a great thing you are doing. Blessings to you. Hi! We want to make our own acts of kindness. Would you mind sharing the template so we could write our own? My son loves the colorful polka dot pattern!